Welcome to Terre Haute, IN, a booming Vigo County city with so much to see and do. As a Toyota dealer near this always-growing area, we wanted to show you a few reasons why we love representing this great community. Terre Haute is home to several universities, including Indiana State University, but that’s not all! Check out sites like the Swope Art Museum, the Terre Haute Children’s Museum, and Hawthorn Park, just to name a few. 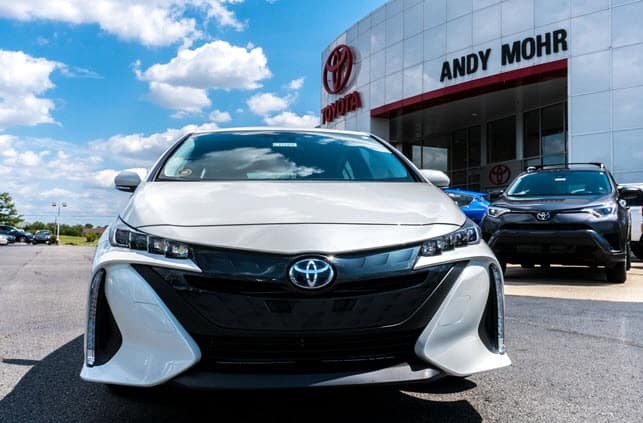 With plenty of places to be, the residents of Terre Haute rely on their Toyota vehicles to get them from one destination to the next—and that’s where our team at Andy Mohr Toyota can help! As a Toyota dealership, we know that our customers have specific needs when it comes to choosing their next vehicle. It might be a pickup truck you’re looking for, like the Toyota Tundra, or a smaller sedan, like the classic Toyota Corolla. No matter what your daily driving needs consist of, your next vehicle is waiting on our lot. You can even check out our entire inventory online, so you can find your favorite and come in ready for a test drive. Financing has never been easier than working with our Toyota dealership. We take pride in helping our customers find the right numbers for their budget, no matter what their financial background. Over the years, we’ve established relationships with banks and lenders in the area, so we can assure you’ll be in the right hands when choosing a loan. Before you sign any paperwork, we’ll make sure to go over any financial lingo or terms that might seem confusing at first. Getting a head start is easy, too, by filling out our finance application online. That way, we can process your information before you arrive, and you’ll be driving home in your new Toyota even sooner. In addition to helping you find the right vehicle and financing options, we want to ensure your vehicle is on the road for years to come. That’s why we have a convenient, reliable auto service center right on site. With a staff of highly trained and experienced auto technicians, we’ll have your vehicle up and running like new in no time. Whether you need a simple oil change or a larger part replacement, we’ve got you covered. Scheduling service is easy, too, with our online scheduler. Just fill out some quick information, and we’ll get you set up with your desired appointment time slot. No phone calls, no hassle, no worries! Visit Your Toyota Dealer near Terre Haute Today! If you’re in the Terre Haute area and considering purchasing a Toyota vehicle, contact us at Andy Mohr Toyota today. We’ll be happy to set you up with a test drive in the vehicle of your choice, and give you more information about our quick and easy car-buying process!